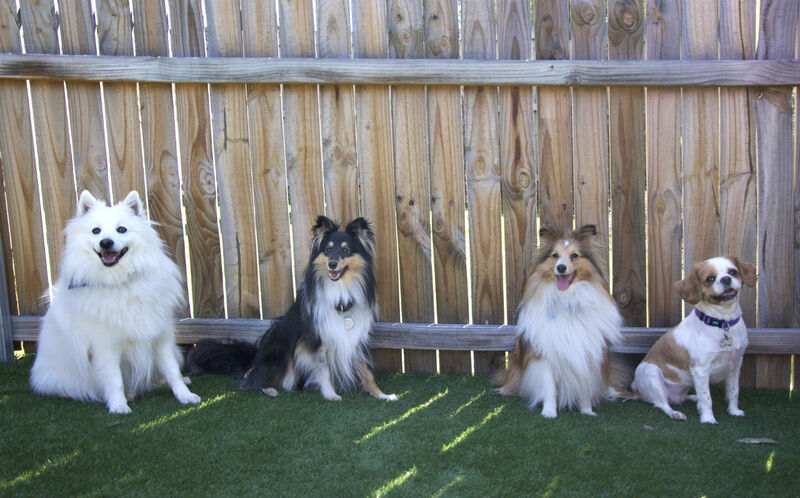 Buddy’s Dog Friendly Birthday Party! My surrogate son Buddy Carr turned four (that’s a big 28 in dog years!) on February 7th, and because this is the first year that we have spent with our furry friend it’s really like he has turned one year old. 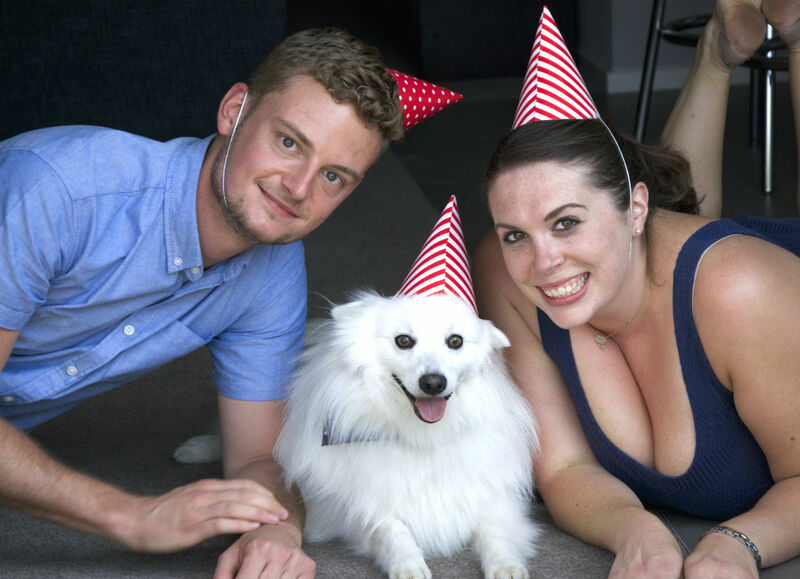 Because of this, we decided to throw a fabulous fur-friendly party for his close friends Ruby, Wiley, and Holly (and their owner’s of course!). My lovely husband Byron Carr designed an amazing red, white and blue interactive email invitation for all of our friends that featured dancing confetti and an appropriately placed party hat adorning our favourite photo of Buddy. We started the invite with the title “I have a bone to pick with you…” as the overall theme for the event, and his hilariously sarcastic reply buttons showcased the light-hearted affair to come for all of the guests! Paper bunting is proving to be quite popular amongst party trends right now, and the fact that it is so versatile and so simple to make means there really isn’t any excuse to adorn your walls! 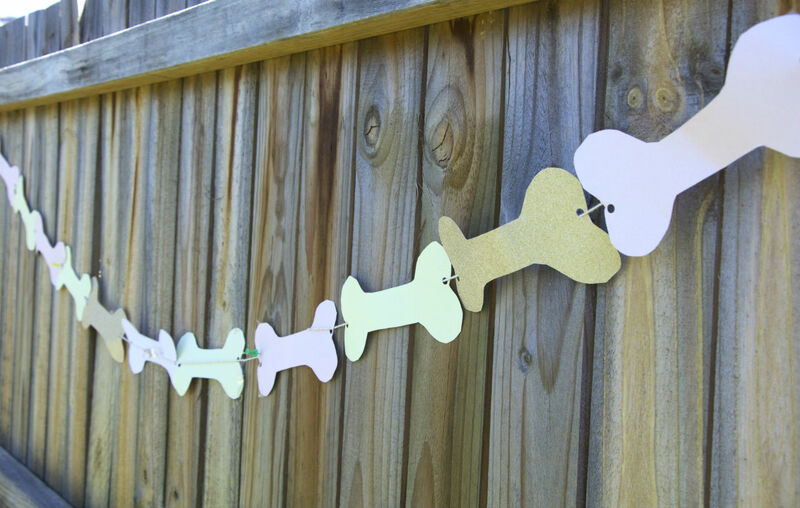 I made the Bone Bunting that hung on our backyard fence out of Baker’s Twine, sparkly cardboard, scissors, and a hole punch. Basically, cut your design out from the appropriately coloured cardboard (draw the same design on each piece of cardboard that you are using) and use a hole punch to create a small hole on either end of the design (ie. either end of the bone). Then thread Baker’s Twine through the back end of the hole, securing into place with tape with a knot (if the hole punch is small enough) or with sticky tape. 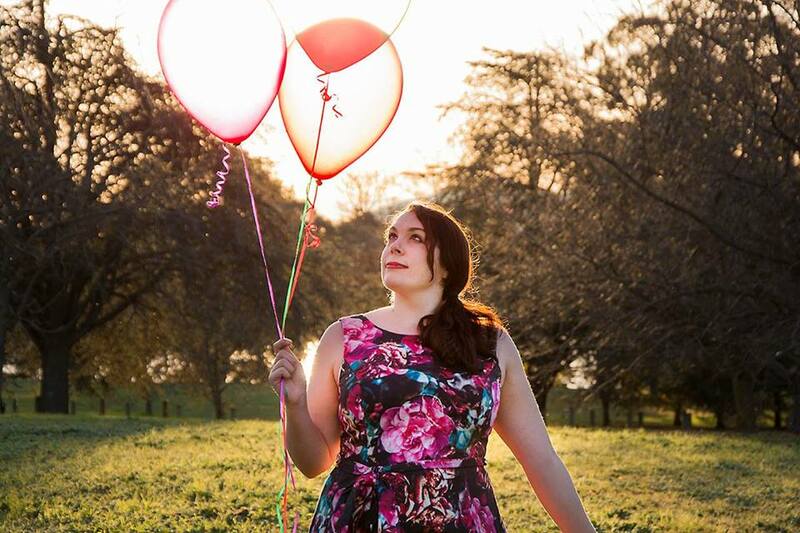 Then hang around your venue for an instant decoration! We didn’t want to go too overboard when it came to decorations, so Byron and I settled for the bunting and the food table to be flanked by a series of red, white and blue balloons to match the party theme and invitations. 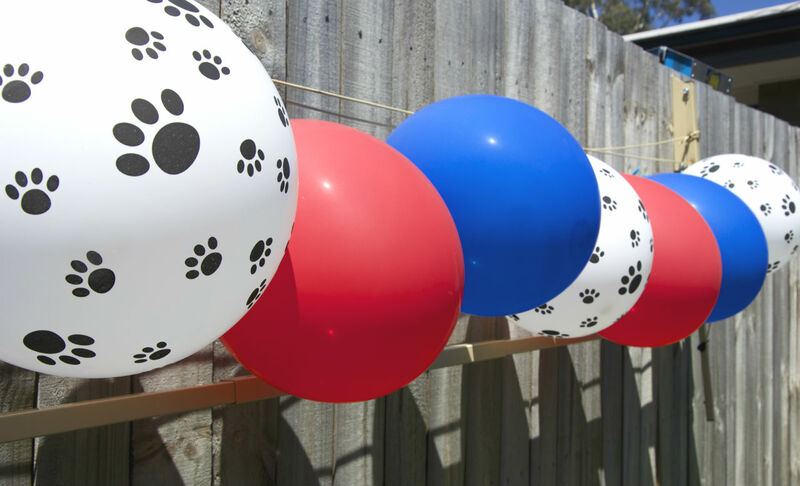 We put a little bit of a dog themed spin on the classic party decoration (and to avoid a general Independence Day/ American theme) by getting white balloons that had little black dog paw prints on them. Super cute, and so appropriate! 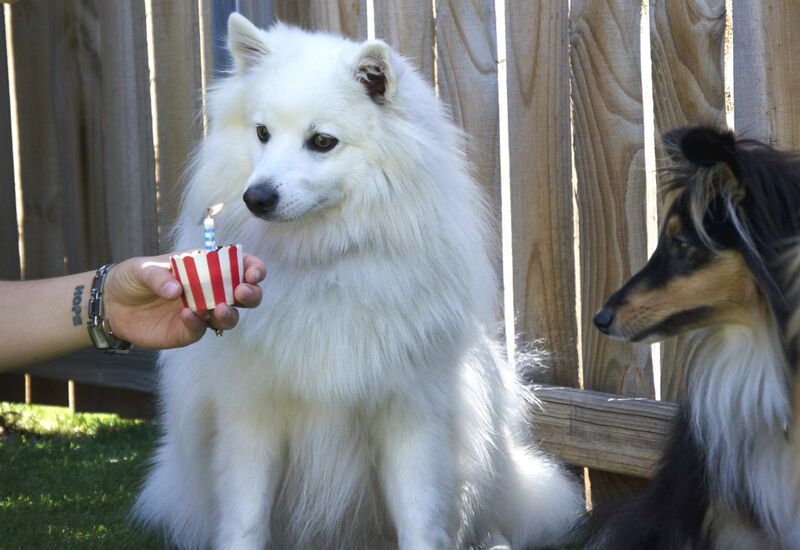 For a dog-friendly party you need to keep in mind the two species you are catering for – humans and dogs! 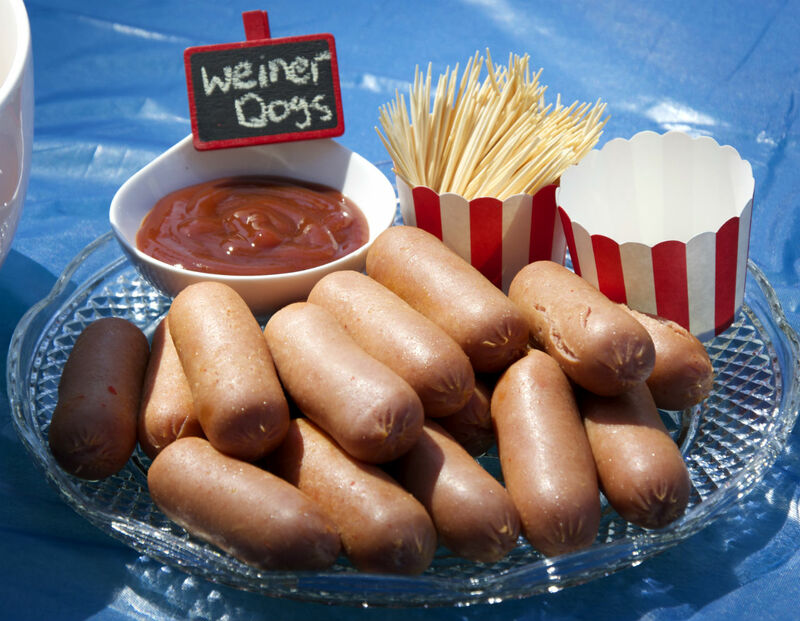 Dogs can’t eat certain things, so you need to make sure these naughty no-no’s (like chocolate, grapes, raisins and certain types of nuts) are nowhere near the party, should any sniffer dogs follow their noses to an unhealthy snack! 1. Pre-heat your oven to 150 degrees C and line a muffin tray with cupcake cases. 2. In a bowl, mix together the flour, oil/egg, yogurt, apple sauce, honey and peanut butter. 3. Spoon the mixture into the cupcake cases and put in the oven for half an hour, or until golden brown. 4. Transfer from the oven and put the cupcake cases on a cooling rack. 5. While the cupcakes are cooling, beat the low fat cream cheese and apple sauce together with a beater. Ice your cupcakes when the cupcakes themselves are fully cooled. This is a tried and tested recipe that is suitable for dog’s stomachs, and also makes them super happy! For the humans, my husband and I served an afternoon tea selection of cocktail frankfurts (dubbed Weiner Dogs), mini vegetarian quiches (also dubbed Dog Beds), chips and crisps, sparkling cherry cordial and fizzy alcohol, as well as some delicious macaroons from our favourite bakery/café so that the guests could treat themselves to something sweet while the dogs munched away at their birthday cakes! What kind of party would it be if you didn’t have party favours? 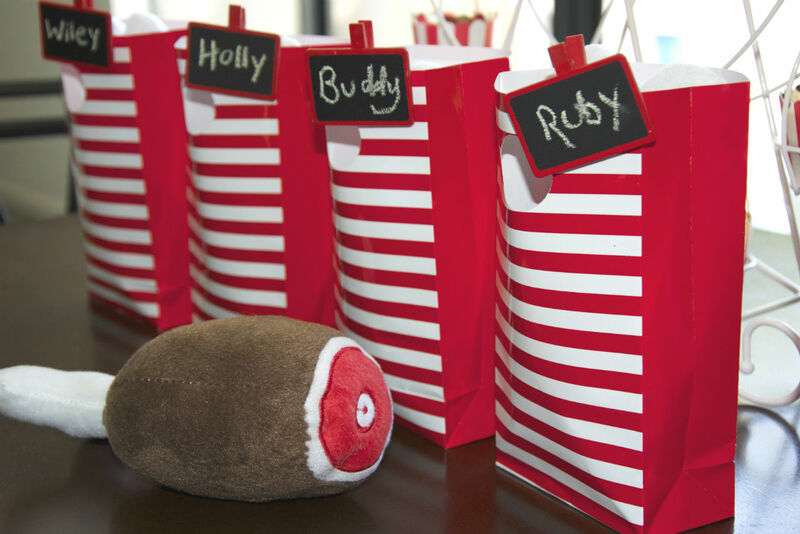 Byron and I discovered that the pyjama shop Peter Alexander sells dog toys, and we managed to pick up a few turkey leg stuffed toys on sale to give out to the four legged guests in red and white striped party bags complete with red chalkboard name tags! It also made a great thank you to all those who brought our baby his own little presents to unwrap!